US President says PM Netanyahu's speech proves he was "100% right" to be critical of Iran nuclear deal, says current situation unacceptable. 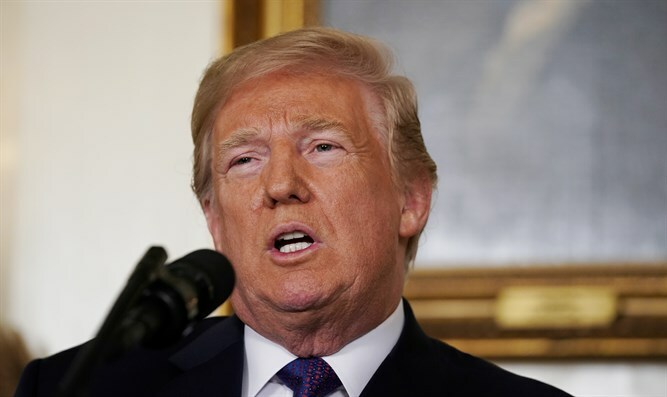 US President Donald Trump praised Israeli Prime Minister Binyamin Netanyahu's speech in which the prime minister revealed an archive of intelligence from Iran's nuclear program Monday. Speaking at Rose Garden press conference Monday, Trump said that Netanyahu's speech "sends the right message" on Iran's nuclear program. “In seven years, that deal will have expired and Iran is free to go ahead and create nuclear weapons," he said. “That is just not an acceptable situation." Trump said that Netanyahu's speech revealed that Iran is “not sitting back idly." He added that Netanyahu's speech confirmed that he was "100% right" to criticize the 2015 nuclear agreement with Iran." However, Trump refused to say whether he would withdraw from the nuclear deal.